Lenepveu, Charles-Ferdinand. 1 unsigned sepia photocard with printed musical ornamentation, 3.5x5.5 / 2 unsigned sepia photo cards, Collection Félix Potin. 1.75x3. Mr. Lenepveu was notoriously known as the center to “l’affaire Ravel” in 1905’s Prix de Rome. Home > Previous Auctions > Ephemera Test > Lenepveu, Charles-Ferdinand. 1 unsigned sepia photocard with printed musical ornamentation, 3.5x5.5 / 2 unsigned sepia photo cards, Collection Félix Potin. 1.75x3. Mr. Lenepveu was notoriously known as the center to “l’affaire Ravel” in 1905’s Prix de Rome. E00820. Lenepveu, Charles-Ferdinand. 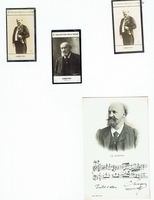 1 unsigned sepia photocard with printed musical ornamentation, 3.5x5.5 / 2 unsigned sepia photo cards, Collection Félix Potin. 1.75x3. Mr. Lenepveu was notoriously known as the center to “l’affaire Ravel” in 1905’s Prix de Rome.